Sometimes I like to eat healthy food. Sometimes I like to eat healthy food that tastes like it’s probably bad for you; fake fatty food, I call it. When you’re trying to be a bit more healthy it can be hard to choose lunches – especially ones on the go. You need something that can be eaten hot or cold, last OK in plastic containers, and doesn’t leave you starving come 4pm. My solution lies in the humble egg. 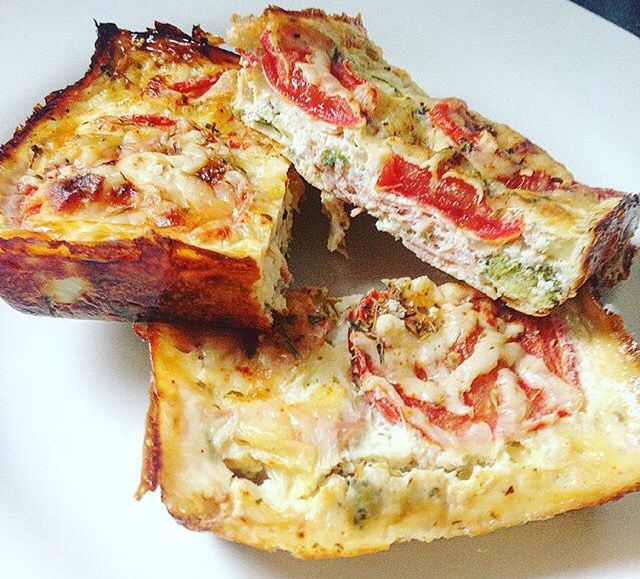 I often make a big bacon and veg crustless quiche for such stages of my working week. Aside from the fact that it’s tasty and full of filling good fats, it’s also cheap as chips to make and lasts for ages. My version below makes about 4 generous portions and lasts for around 5 days in the fridge. I like mine with a big green salad. Fry the bacon with the mushrooms, onion, garlic and asparagus. Add salt and pepper and cook well then set aside. Spoon the bacon mixture into a flan dish. Mix the eggs, cottage cheese and cheddar cheese in a bowl and spoon over the bacon mixture. (I sometimes like to sprinkle a little cheese on the top for a crunchier topping). Top with the tomato slices and bake at around 200c for 15 minutes until the quiche feels set to the touch.